Registration for the conference is now live. You can register for the conference as a whole, or for Saturday only as our designated community day. Saturday programming will have an emphasis on local sustainability and community organizing where we will welcome participation from practitioners, activists and change-makers alike. Registration is free to all who self-identify as Indigenous. The CANSEE 2019 Scientific Committee completed double-blind peer reviews on all presentation submissions and sent out acceptances in March. If you intend to present at CANSEE 2019, please register to secure your spot in the conference program. A final program of detailed presentation content will be available at the start of May. The conference will be located at the CIGI Campus in Uptown Waterloo: 67 Erb Street West, Waterloo, ON Canada N2L 6C2. Parking is not available on-site during the weekdays, but the various city lots in Uptown Waterloo are available. Parking on-site will be available on Saturday. 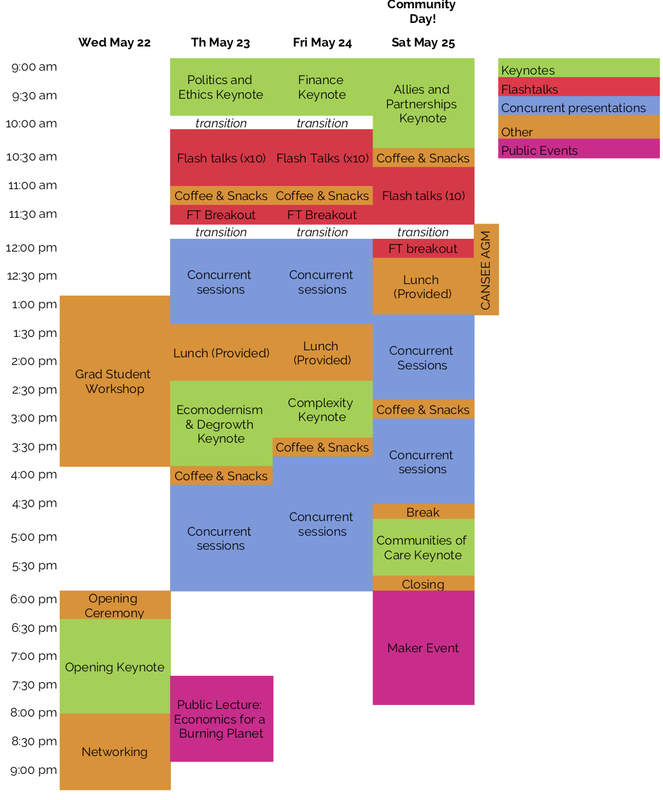 The following offers an outline of the conference schedule. The date and time of individual presentations and special sessions will be determined by the end of April, as will details for the public events. Participants are encouraged to arrive in Waterloo on Wednesday and join us for the evening opening keynote and networking event. The registration desk will be open at the venue starting Wednesday (22) afternoon. Airports:Toronto Pearson International Airport (YYZ) is Canada’s largest airport and only one hour away from Waterloo. There are bus routes available from the airport (see below) as well as direct shuttle services at a higher price point. The Region of Waterloo International Airport (ALO) and the Munro Hamilton International Airport (YHM) are smaller local airports but flights may be more expensive. Buses:There are frequent bus routes between Toronto and Waterloo offered by both Go Bus and Greyhound. The buses make stops in Kitchener at the Charles Street Bus Terminal, and in Waterloo at both the University of Waterloo and Wilfred Laurier University. The local Grand River Transit bus system connects Kitchener and Waterloo (30min ride). Train: Via Rail trains operate from most major Canadian cities to Toronto with connections to Kitchener. You can also choose to book a train to Toronto and take a bus to Waterloo. We have reserved a block of hotel rooms at the Delta Waterloo which is located across the street from the conference venue. We have negotiated a preferred rate of $174/night. Click here to book a room at our Group Rate, which Delta has made available until April 23. We have also booked a block of dorm rooms at Wilfred Laurier’s King Street Residence, which is a 20min walk to the conference venue. Final rates are $59/night (private bed w semi-private bath) or $79 (private bed & bath). This dorm includes lounges with a fridge, stove, and microwave, as well as parking and internet. Click here to book a dorm room at the King Street Residence. In efforts to prioritize inclusivity at the event, we have facilitated free childcare services for the duration of the conference. If you require these services, please register before May 3 to indicate your needs or contact the conference co-chair Sophie at ssanniti@cansee.ca to inquire further. In the registration form you were given an opportunity to express any needs regarding diet or other accommodations to fully participate in this event. Please be in touch if there are any changes.